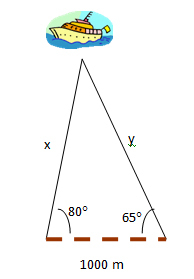 Solving a triangle means finding the measurements of its sides and angles. 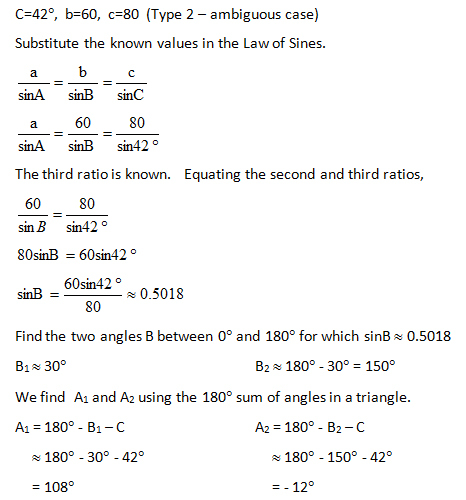 The Law of Sines is used to solve oblique triangles. In the triangle below, sides a, b, and c are opposite angles A, B, and C, respectively. the letters a and A correspond. This is true for the two other ratios. 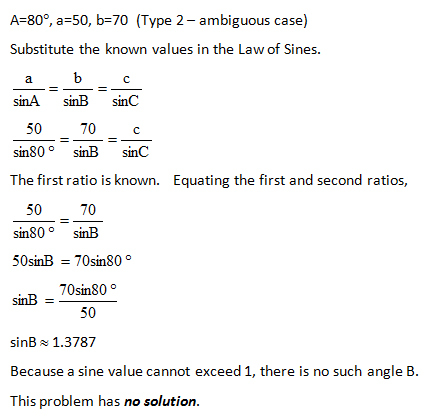 The second is called the ambiguous case since there can be no solution, one solution, or two solutions. 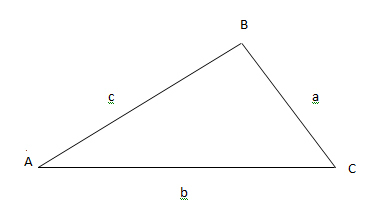 Solve triangle ABC if A=32°, B=48.5° and c=32.4. Round the sides to the nearest tenth. The given are two angles and one side (Type 1). 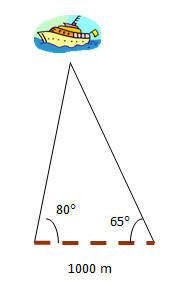 First, we find the third angle C using the property that the sum of angles in a triangle is 180°. 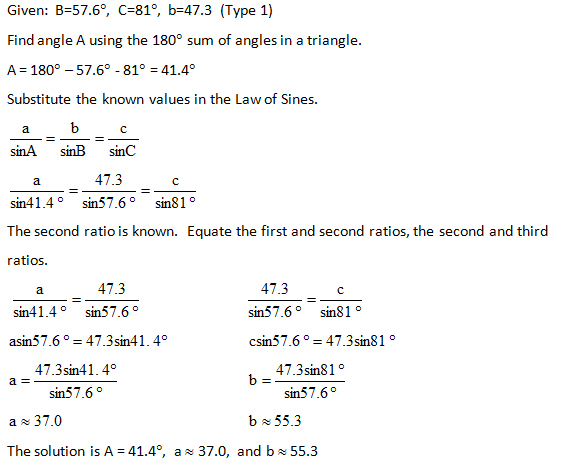 Substitute the known values in the Law of Sines. 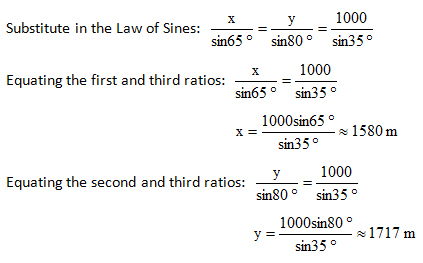 The third ratio is known, so to find a, equate the first and the third ratios. 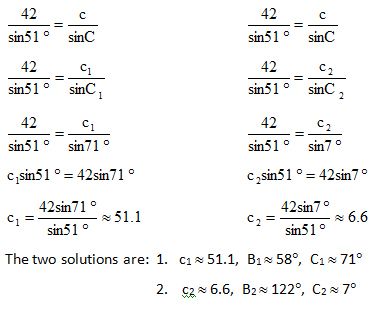 Similarly, to find b, equate the second and third ratios. 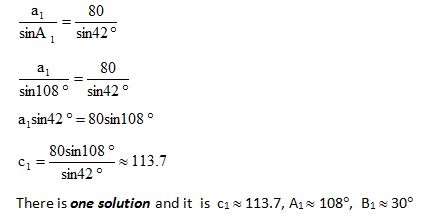 Solve triangle ABC if a=42, b=46, and A=51°. Round the sides to the nearest tenth and angles to the nearest degree. The given are two sides and an angle opposite a given side (Type 2 – ambiguous case). For numbers 1-3, solve triangle ABC. Round the sides to the nearest tenth and angles to the nearest degree. The figure shows a 1000-meter-long sand beach and a boat at sea. The angle made with the boat from one end of the beach is 80° and from the other end is 65°. Find the distance of the boat (rounded to the nearest whole number) from each end of the beach. Since the A2 value is negative (that is, the sum of the three angles exceeds 180°), we eliminate the second possible solution and pursue only the first solution. 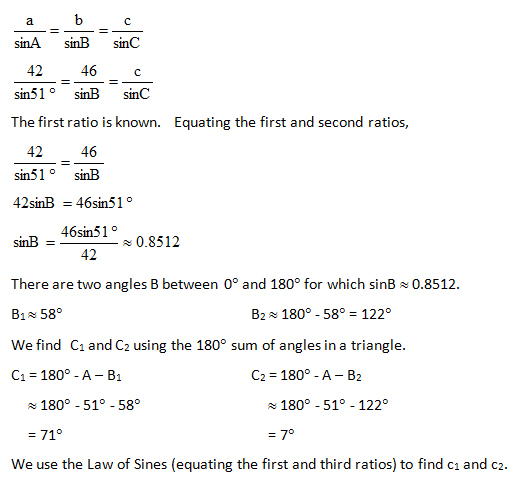 We use the Law of Sines (equating the first and third ratios) to find a1. This is the case where two angles and a side are given (Type 1).